It is a New Year~What is your BHAG? Perhaps, hope? All my clients know that when January rolls around I will be asking them what their Big Hairy Audacious Goals will be for the coming year!! What goal or breakthrough will they focus on , believing that as they are faithful God will do the miraculous!!! 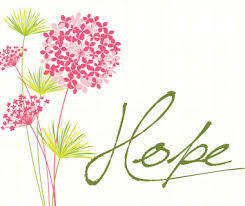 Hope is an amazing thing; it breathes life into our spirits!! As you enter this new and amazing year; a year with no mistakes in it yet…..set your sights high, believe for miracles, look for breakthrough, find life balance amidst the busy life you live!! Your faith, your story, your miracles with serve to encourage the hope in all those around you!! At the ripe old age of 55, I have learned that sometimes the miracles don’t get answered the way I expected!! The hope doesn’t always show up in the way I have mapped it out! But…the miracles do come and His hope does flood my soul. This year, make hope your goal! He is with you. I wish you a wonderful- hopefilled New year! Thanks for taking this journey called “life” with me! !